Is your comment not appearing in the thread or are you unable to post? The best way to learn more is to check in your comments feed within your profile for the status of the comment or contact the site moderator who will have more information on why your account was blocked. This message indicates that your account has been placed in timeout by a moderator. Timeouts are temporary, and last for any amount of time specified by the moderator. Most websites have a contact form or email address listed to get in touch with their moderators or support team. To find a site's contact page more quickly, it can help to google: [website name] "contact us"
Please note that sites are not required to provide contact information and in cases where the site doesn’t provide contact information, Disqus won’t be able to put you in contact with that site’s moderator. If you see one of the above messages next to your comment, try reaching out to the moderator of the site where you posted the comment; site moderators are the only ones with the authority to approve a comment or explain its status. If none of these messages appear next to your comment, there could be a lag in duplicating this data across the Disqus system, so try revisiting the thread at a later time to see if the comment is visible. 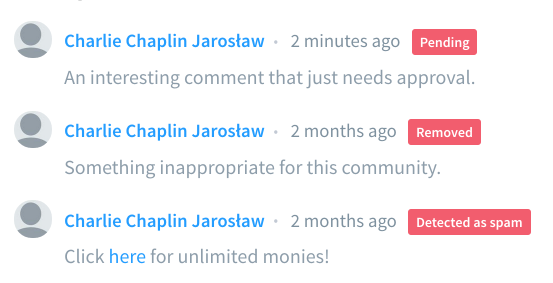 If your comment is awaiting pre-moderation, it will appear as pending in your profile > comments feed. Disqus does take action across our network on comments, profiles, and discussions that violate our Basic Rules, including spam. However, when it comes to individual sites and communities, Disqus takes no part in moderation decisions (e.g., approving comments, deleting comments, or handling disputes among commenters) nor can we offer an explanation as to why a comment or a user account has been moderated. These decisions are made by websites using the Disqus service (the "site moderators"). Commenting experiences can differ greatly depending on the individual site's moderation practices/policies. Policies and settings can vary widely between Disqus-enabled sites.